One of the ways of escaping from piece being taken is running away with it. But what can be done, if the piece cannot escape easily? How can we catch the king? Those two questions have similar answer. We say that the piece is being defended, when its standing square is covered by other piece. The point of covering your pieces is that the opponent cannot take your piece for free. Like in this example the gold is protected from the rook by the king. Here are the examples of our pieces being attacked. Try to defend them using other pieces. Protect problem 1 – the lance is under attack of the silver. How do you protect it? Answer: Move gold to 8i. Protect problem 2 – the rook is attacking your gold on 4i. If you simply move (for example 5h), the rook will take your silver on 3i! How do you protect both pieces same time? This problem has actually two answers. Protect problem 3 – your king is in a check! How do you avoid losing the game? Answer: Move the silver to 2h. This way the attack of the bishop is blocked and you are safe. Knight jump 3g also blocks the bishop, but can be taken for free. To attack the king, the pieces need to cooperate. They need a numerical advantage. Usually, two attackers vs one king. If the king cannot escape from threats (checks), we call it a checkmate. You can probably understand, that protecting king with other piece has no effect – when you take a king, the game ends. The king is the only piece you cannot give up to your opponent. Here are examples of one move checkmates. Try to solve them and think why the king have no escape. Answer: Gold moves one square forward to 5b. Gold covers all the squares that king could escape to and it is protected by the lance, so it cannot be taken by the king. It is a checkmate. Answer: Gold moves to the side, 8c. The king is blocked from the side by board borders, then blocked by his own pieces on top and bottom. 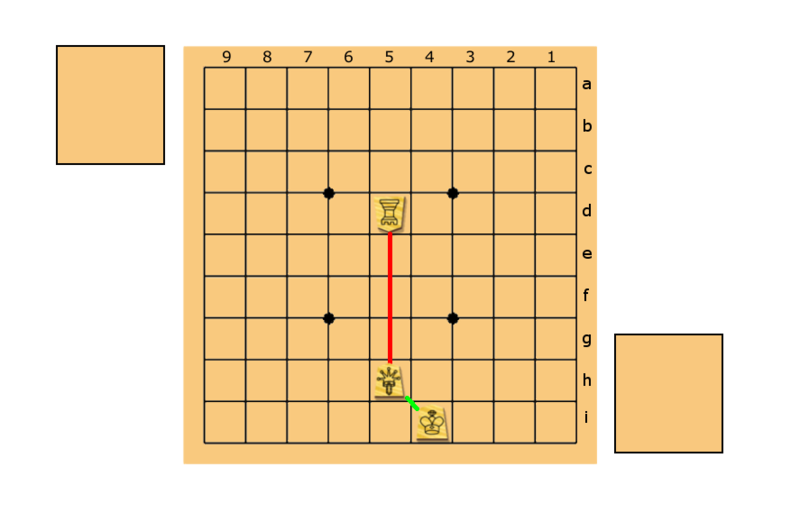 Gold move attacks the king directly. Lastly, the king cannot run to 8a because of the silver. (small comment) There is mate in three moves as well, silver to 8c, king to 8a and gold to either 8b or 7b! Answer: Knight move to 8c, checkmate! King has no escape. The knight’s weird movement is greatly useful in such a position. Finally, problem 4 – what if opponent makes a strange move and put his king next to your king? Answer: Do not run away! King to 3g square! The first one to take the king wins! Now that we know how to take and protect pieces, we can learn little bit more about their values.